I don’t remember how I first heard about Annie on My Mind by Nancy Garden, but what I do remember is that I immediately set out to get a copy by any means necessary. I was a 16-year-old with a debit card and access to the amazing world of online shopping, where I selected my book and pressed order… and then I panicked. I staked out the door of my parents’ house every moment I could, looking for the delivery person and hoping that my parents would not discover the contents of my soon-to-be-delivered item. Why was I so concerned about my family knowing the type of reading material I had selected for my first online purchase? 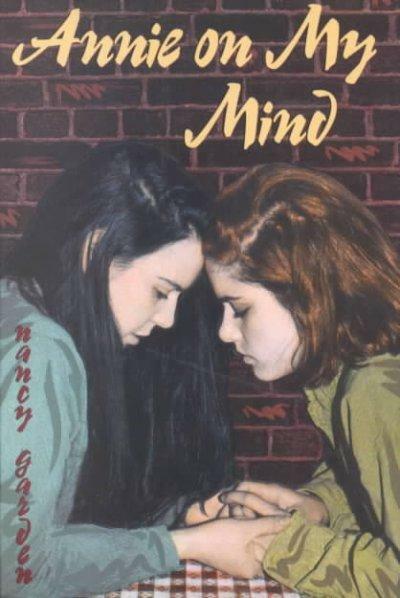 Annie on My Mind was the first book I read that featured a love story between two women, and the cover pretty clearly indicated its subject matter. My panic turned out to be for naught as the book arrived and no one in the house batted an eye toward it. Published in 1982, Nancy Garden’s novel about Liza and Annie has never been out of print. Its influence on young adult (YA) literature was made clear when School Library Journal named it one of the "One Hundred Books that Shaped the Century." You’ll also find this book on nearly every list of must-reads for queer women. The novel’s dedication reads "For all of us", a testament to Garden’s intention to give queer women an opportunity to finally see characters like themselves get a happy ending. Coming back to this book all these years later, I had some extreme feelings of nostalgia. It was so easy to remember how it felt when I first read it. I will say that the book does feel a bit dated now, but I mean that in the best of ways. So much has changed since Garden penned this story in 1982. In the novel, Liza and Annie start without any sense that there other people like them in the world. In today’s world, they could find role models in the television shows and movies they watched and in the books they read. They would have examples of people in all walks of life where they could see themselves represented. When I first got a hold of Annie on My Mind, I thought it was the only book like it that existed, a simple glance at my Goodreads shelf would tell you that I’ve found quite a few more since then. In the years since I got my hands onto that book, the number of YA novels published featuring LGBT characters is absolutely astounding. Now in my position as a Teen Services Librarian, I’m delighted by the plethora of new books that feature all types of characters and relationships that I can provide to my patrons. The feeling of giving a teenager a book with a character that they can relate to is one of the best parts of my job. I enjoyed this book too. When I saw it at Barnes and Noble, I immediately grabbed the book and paid. Since then, I paid special attention to the publishing company that publishes LGBT books. There really are a lot of LGBT books and I noticed some came from Bold Strokes books. Found another publishing company called Ylva, that also publishes LGBT books.